"I certainly see how you've won the IBM awards. I see this product giving us development power like I've never seen before in my 30 years in this profession." Essex Technology Group, Inc. (Essex Tech), is an IBM designated Premier Business Partner, acknowledged by IBM as a "go to" player for full-service infrastructure, continuous operations, and implementation consulting services. We offer a unique combination of certified technical expertise and proven experience, which has earned us several prestigious IBM Business Partner Awards, including the "Americas Business Partner Leadership Award" and the "Services Sales Award." IBM Global Services recently established a business partner requirement mandating the production of a Web application to allow IBM customers the ability to access hardware and software contact data via the Intranet. Essex Technology Group, an IBM premier partner had only a few weeks to comply. 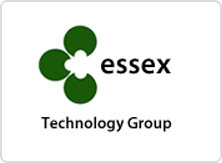 WOW (Web Object Wizard) allowed Essex Technology's Customers Web access in a secure environment. Within four days of receiving the Excel files from Essex, PlanetJ Corporation built an IBM contract tracking, self-service application. IBM Global Services notified business partners (Essex Technology) of a maintenance contract requirement. Essex is a reseller of IBM hardware/software products and services. In order for Essex to stay compliant with IBM Global Services, they needed to come up with a solution that would allow IBM customers Web based access to help manage maintenance and warranty contracts. To date this data was being stored and manipulated using Microsoft Excel worksheets. PlanetJ uploaded these files from Microsoft Excel to the AS/400 to be used as the basis for the Web application. Developers at PlanetJ stated this project was really a "slam dunk" for the Web Object Wizard! IBM required a specific deadline for the warranty application to be put into place. Kathy Bourn (Director of Sales Support for Essex Technology Group) was concerned when PlanetJ started this project that there would not be adequate time to fulfill the timeline requirements of IBM. Not true. Bourn stated "Until WOW came down the road, I didn't know how we were going to do this with the tight schedule". By using the WOW development tool, this application was created in just over one week. Customers sign on to "Customer Maintenance Contracts" using their company name and password. WOW authenticates the sign on against a backend iSeries UDB/400 database. This is done very easily without any Java coding via WOW's built in self service authentication operation. If authentication succeeds, the user is able to access their information as shown below. After the user enters a correct company name and password, further instructions are provided. The user is then able to view all of their IBM product contract and warranty data, and search for product by location, serial number and type/model. After clicking the online rental button above, the following screen will appear. They may also update company information and change their profile to enhance security. Essex Technology group has an administrative page that houses these updates, and they can follow any changes live. Additional enhancements provided by WOW included automatic Excel upload, location drop down, and administrator access. 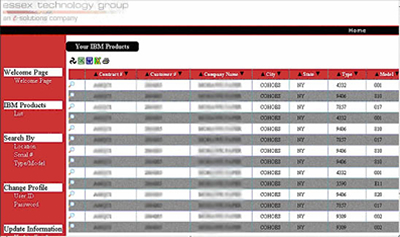 Essex Technology had their warranty data stored on an IBM iSeries running V5R2. WOW 6.3 was installed on a Windows 2000 Application Server and an external firewall monitored access and blocked any unauthorized access. WOW's ability to create Web applications in record time saved the day for Essex. Typically, WOW can create Web applications 100x faster than traditional development techniques without requiring expensive and time-consuming training in Java. WOW combined with the IBM iSeries provided Essex Technology Group with their required Web application in a matter of a few days and was even completed 25% below a very small budget! Bourne of Essex further commented, "Working with PlanetJ has been a very positive experience. The work is done professionally and response time to additional requests has been exemplary. I was particularly impressed with WOW's capability of making changes to the application and database structure "on the fly" during a conference call. I can see why the product is winning support with our customers."